In 1884, fifteen years after the AVS Alpine Club was first instituted, the Vinschgau section was founded in Mals by Heinrich Flora. After the First World War, South Tyrol was handed to Italy, and when the Fascists seized power all German-speaking clubs, including the AVS, were banned. It was not until 1965 that plans were made to re-establish the section; the material reason for its reinstatement was to rebuild the “Höllerhütte” hut in the Matsch valley. This mountain hut had already been built in 1883 by the Prags section of the AVS Alpine Club, and was then called the Karlsbader hut (renamed “Höllerhütte” in 1902.) In 1945 it burned to the ground and so it was to remain for some time to come, a bleak ruin at the foot of the Oberettes glacier. Reconstruction plans were not fulfilled for some time, the reason being that the hut lay on the border with Austria and belonged to the state, which, devastated by repeated bombing, controlled the borders closely. In the 1970s and 1980s the political situation took a turn for the better, and the AVS Alpine Club was in a position to rebuild two shelters: the former Pforzheimer hut in the Schlinigtal Valley, now the Sesvennahütte, and the former Höllerhütte, now the Oberetteshütte. The Mals section was renamed the Upper Vinschgau section in 2013. The Matsch regional branch of the AVS was founded in April 1979 and was extremely pro-active right from the beginning: in 1980, its members marked the main climbs in Matsch and purchased equipment. Summit books were deposited on the most famous mountains, and a youth group was founded. In 1983, together with people of Langtaufers, the Matsch branch laid the summit cross on the Weisskugel, which was inaugurated in 1984. In 1984 and 1985, the Alpine Club forged ahead with the construction of the Oberettes mountain hut: a material cable car was constructed, along with water pipes to the hut and a hydroelectric power station. Numerous committed volunteers and an energetic branch leader, Wilhelm Gunsch breathed new life into the bereft walls. 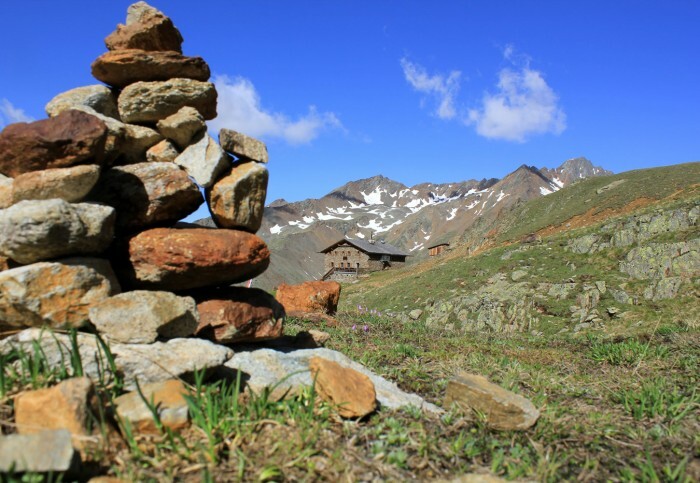 Summer after summer, Sunday after Sunday, in rain, snow and sun: the Matsch labourers and a number of Vinschgau craftsmen hammered, walled, concreted and carved until 1988, when the new hut was officially opened. Over the years the club has organised countless hikes, high-mountain and ski tours and climbing expeditions and naturally, the sociable aspect was in full attendance. Finally, the summit cross on the Pleresspitze was laid and some bridges in the valley end of the Matsch were rebuilt. Every year, the village of Matsch helps to maintain the many paths and paths. Matsch’s “own” mountain, the Weisskugel, looks back on a long alpine history. According to a report by Archduke Johann of Austria, the first ascent of the second highest summit of the Ötztal Alps at 3,739 metres was probably accomplished in the summer of 1845 by the two mountain guides from Schnals, Johann Gurschler and Josef Weitthalm. However, as this report went ignored for a long time, the Viennese tourist Josef Anton Specht claimed the title of first ascendant of the Weisskugel in 1861. The name Weisskugel derives from an interpretation of the word “Kogel,” a special form of a mountain summit in Tyrol. Due to its central location, the view from the Weisskugel is one of the most wide-reaching in the Alps.